Defense Out-scoring Prosecution in First Bundy Nevada Trial? | RANGEfire! Defense Out-scoring Prosecution in First Bundy Nevada Trial? 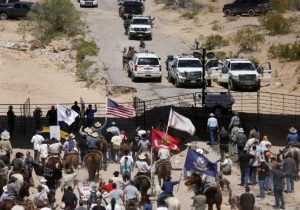 According to John L. Smith, this week at the Nevada Bundy trial belongs to the defense. John L. Smith has been camping out at the federal courthouse in Las Vegas, covering the first of three trials related to a tense 2014 standoff between Bunkerville Rancher Cliven Bundy and Bureau of Land Management officers. The Defense just kept bringing up the name of Daniel Love, who was in charge of the operations at the 2014 standoff at the Bundy Ranch. Love is now embroiled in a controversy surrounding Burning Man. And the defense is trying to use that to discredit not just Love, but his entire operation. Then there is the testimony of BLM agent Logan Briscoe. He testified that he was afraid, but in fact he was 300 yards away from the protesters, and said under cross examination that he never saw a gun pointed at him. Briscoe also took a cell phone picture of the scene – a point that the defense says is unprofessional. This was all captured with body cameras. “In my time as an observer in the courtroom, he appeared to be candid but I don’t think he helped the prosecution very much,” Smith said. BLM agent Mark Brunk was closer to the action, and John L. says his testimony played better. He did see guns pointed at him and other officers. Body cameras also captured the chaos of the scene, with quite a few protesters yelling at the BLM rangers. The prosecution says this contributed to an atmosphere of fear. Prosecutors played video of Pete Santilli, who seemed to be riling up the crowds. Santilli is on trial later in the year for being one of the leaders of the protest. The defense may start its portion of the trial next week.